Suspicious objects have been spotted in the southern Indian Ocean by a Chinese plane hunting for the missing Malaysia Airlines jet as more nations joined the search, China’s state media say. Searchers saw two “relatively big” objects with “many white smaller ones scattered within a radius of several kilometres”, Xinhua news agency said. Australia said it had been informed and would try to locate the objects. 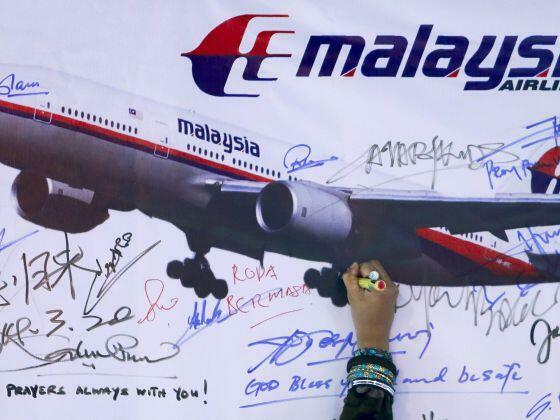 Malaysia Airlines flight MH370 disappeared on March 8 while en route from Kuala Lumpur to Beijing, with 239 people on board. Ten planes were scheduled to scour the southern Indian Ocean area on Monday for possible debris picked up earlier by radar echoes and satellite imagery. Two Chinese military planes flew out to the search area, around 1,550 miles south-west of Australian city Perth, on Monday morning, while two Japanese P-3 Orion aircraft set off later in the day. They joined six other planes, including US and Australian military planes, in searching a 26,000 sq miles area in the ocean. An Australian navy ship is already in the area, while several Chinese ships are also on their way. “When two of our IL-76 planes were searching the relevant suspected sea area, one of the planes photographed white, square floating objects,” Chinese foreign ministry spokesman Hong Lei told reporters at a regular press briefing. “At present we are unable to confirm whether the floating objects are related to the missing passenger jet,” he said, adding that China was currently analyzing the photographs. The IL-76 crew has given co-ordinates of the objects to the Australian Maritime Safety Authority (AMSA), as well as China’s ice-breaker Xue Long, which is heading to the area, Xinhua news agency says. AMSA, which is co-ordinating search efforts, said in a statement it “was advised about the reported objects sighted by a Chinese aircraft. However, the US Navy P8 Poseidon plane tasked with investigating the reported sightings was unable to relocate the objects, AMSA said later on its Twitter feed. Earlier, the authority had warned that weather conditions in the search area were expected to deteriorate.